Reversible enzyme activation achieve fast and robust PCR. 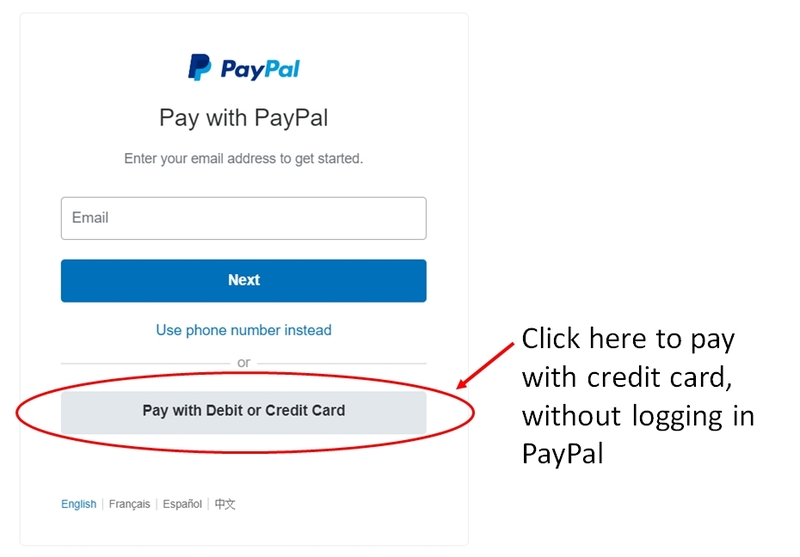 - 1 minute hot start: save 15 minutes ! Reversible 1-min Hot Start Taq DNA Polymerase is an optimized mixture of superior Taq DNA polymerase and a proprietary inhibitor. The inhibitor reversibly binds to Taq polymerase at temperature below 50°C, and completely inhibits polymerase activity before and after PCR reaction, thus allowing reaction setup at ambient temperature. 1. Fast Hot Start (30 seconds to 1 minute): Initial thermal activation can be achieved by incubating the assembled reaction at 95°C for as short as 30 seconds. Save up to 15 minutes comparing to other Hot Start Taq polymerase, and therefore significantly shortens the reaction time. 2. 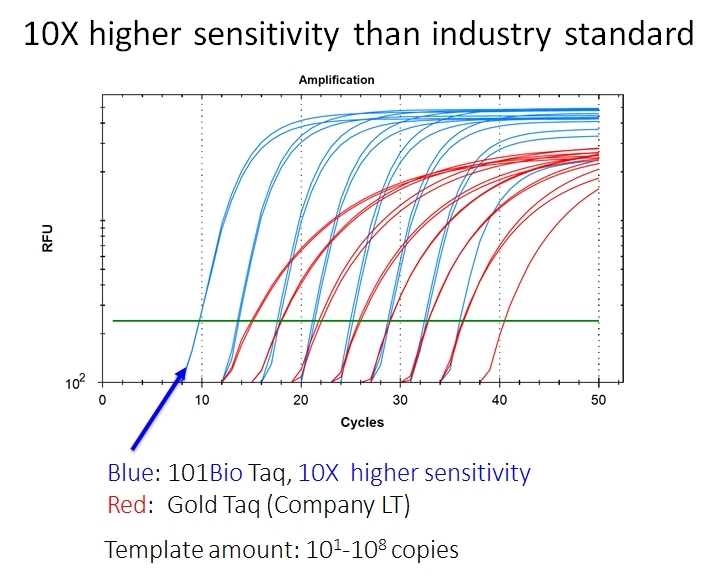 Exceptional sensitivity: The polymerase can amplify low-abundance template (single-digit copies) in the reaction. 3. 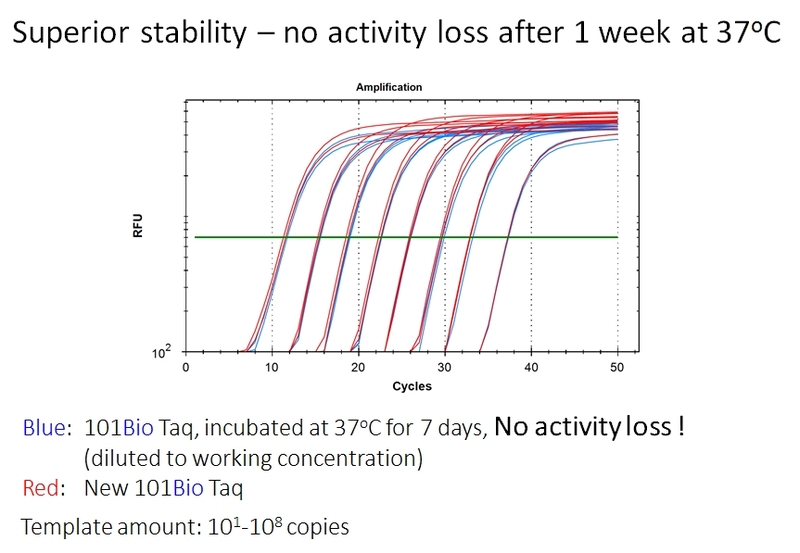 Superior stability: The polymerase activity remains the same even after being stored at 25oC for 7 days. 4. 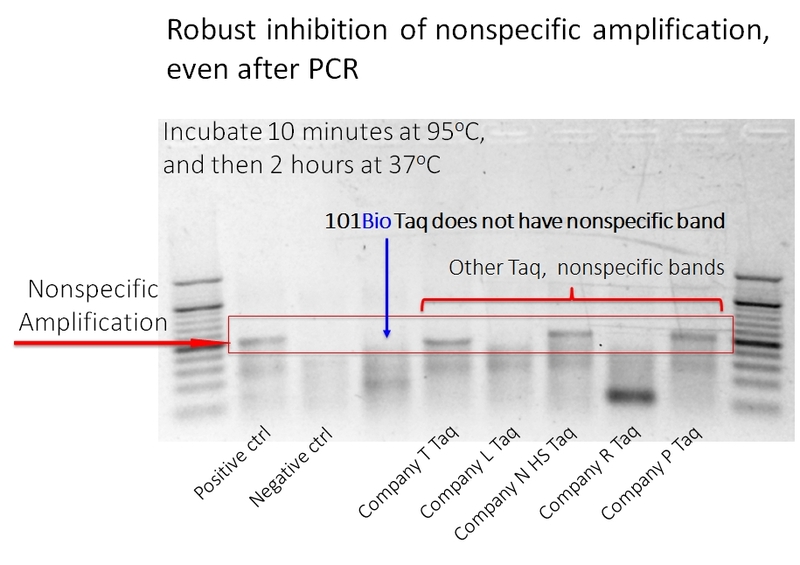 Reduced nonspecific amplification: Unlike traditional antibody-based Hot Start Taq polymerase, which loses its “hot start” function once activated, the inhibitor in this product will continue to inhibit the polymerase activity whenever the temperature drops below 50oC, even AFTER the PCR reaction. 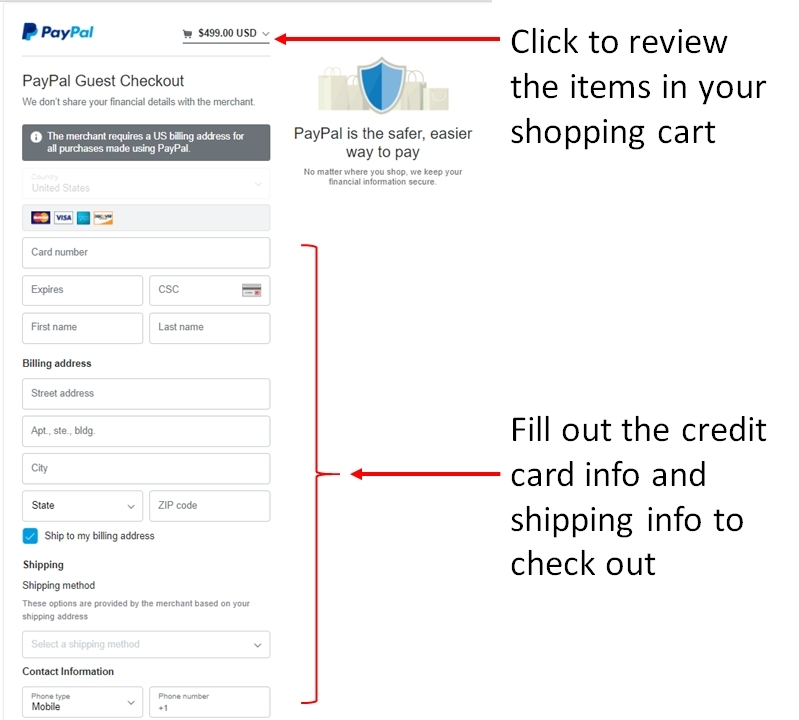 This unique feature allows researchers to manipulate the PCR product without worrying about nonspecific amplification. The polymerase has a 5´→3´ DNA polymerase and a 5´→3´ exonuclease activity, and catalyzes the non-template directed addition of an adenine residue to the 3´-end of both strands of DNA molecules, making it suitable for TA cloning. The proprietary polymerase/buffer formulation accommodates extended cycle numbers (45-50 cycles). Ship at 4oC. Store at -20oC for up to 2 years and avoid freeze-thaw cycles. Store at 4oC for up to 6 months. This product is tested for no exogenous nuclease activity; no host DNA contamination tested (by PCR); able to amplify single copy gene from multiple genomes; and no significant enzyme activity decrease after storing at 2 ~ 8oC for 6 months. Note: For best results, start with a final concentration of 0.4 μM for Forward and Reverse Primers. For optimization, test the concentration range between 0.15 to 1.0 μM. Magnesium concentration may also be adjusted to achieve best results. To achieve the fastest turnaround, the Hot Start activation can be reduced to 30 seconds. The extension time should be adjusted according to the length of target PCR product size. The amplification speed of this Taq DNA polymerase is approximately 1 kb DNA / 60 seconds. The Annealing temperature should be adjusted based on primer and template composition to achieve the best result. After PCR, mix 5 µL PCR product with loading dye and run electrophoresis.